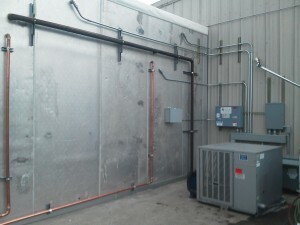 Industrial Cooler - McDonald Refrigeration, Inc. Industrial Cooler – McDonald Refrigeration, Inc. Existing industrial cooler upgraded with new evaporators, R404-A Freon, copper lines, electrical, and custom control panel. Box temperature can run at 28F or warmer if needed. Systems runs on a 5HP Copeland semi-hermitic discus condensing unit. 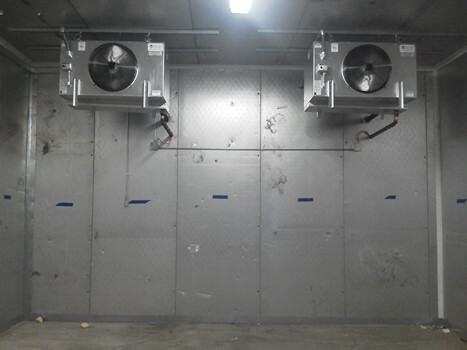 The unit coolers are designed for larger walk-in coolers and freezers as well as warehouse cooler and freezer applications for product pull down and storage in commercial and industrial refrigeration markets. The ‘A’ Series unit coolers are constructed of a heavy gauge smooth finish aluminum cabinet with a copper tube, aluminum plate fin coil, and permanently lubricated ball bearing fan motors with inherent thermal protection.